Neringa’s dunes are a natural wonder. Text and photos by JULIE SKURDENIS. THE CURONIAN SPIT (KURŠIŲ NERINGA) IS A 60 mile long narrow finger of forest and sand that separates the Curonian Lagoon (Kuršių Marios) from the Baltic Sea. The northern portion of the spit is Lithuanian. It’s called Neringa after a legendary giantess who supposedly created the spit by scooping up sand in her apron to create a barrier against the open sea. The southern portion belongs to the Russian exclave of Kaliningrad. In 2000, both portions were included on UNESCO’s prestigious World Heritage list. Although only minutes away by ferry from Klaipėda, Lithuania’s third largest city, Neringa is a world apart. A single road runs the length of the peninsula passing pine and birch forests, towering sand dunes, colonies of nesting birds, and a string of tiny villages lining the lagoon side of the peninsula. The villages are dotted with distinctive wooden chalets that look like a backdrop for a fairy tale. Many have upper story balconies, flower boxes, and gardens that are a riot of vibrant color during the summer months. There are also the ubiquitous weathervanes called vėtrungės. 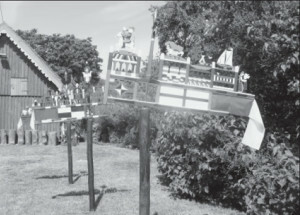 Although they are all made of wood and are of uniform size (except for the small souvenir vėtrungės), each village had a distinctive pattern making it easy to identify which village a fishing vessel belonged to. Even villages off the Curonian Spit on the eastern coast of the lagoon had these vėtrungės. Over the past 200 years, vėtrungės on the spit itself came to be highly decorated and individualized with animals, houses, churches, plants, and ships. They are a unique form of Lithuanian folk art. 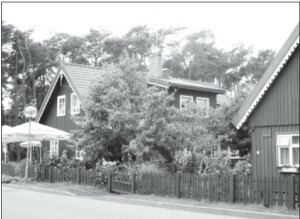 On the Neringa peninsula, there is no village more blessed with lovely houses, natural beauty, and vėtrungės than Nida. Located at the very end of the Lithuanian portion of the Curonian Spit, Nida is only a few miles from the Kaliningrad/Russian border. Nida is a place of quiet beauty, ideal for long strolls followed by a bite to eat at one of many cafés and restaurants. If you’ve visited Palanga, you know how bustling it can be in summertime, especially along Basanavi- čiaus gatvė where it sometimes seems like non-stop partying. Nida is different. Even though visitors come in droves to eat and drink, it’s much more laid-back than its sister resort city up the coast. 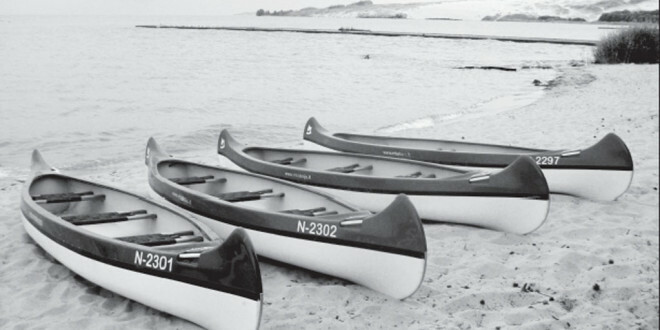 This is what makes Nida so special – its serenity as well as its beauty. From the southern end of the village, visitors can stroll beside the lagoon through tall, fragrant pine forests to immense sand dunes, protected by law but still permitting visitors to climb via wooden staircases for views over the village, lagoon, and dunes. Colorful cottages dot the length of the peninsula. 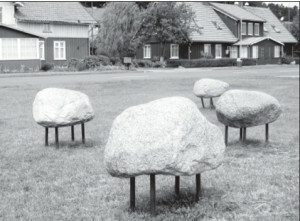 On the eastern side of the village, a long pathway winds beside the lagoon past sculptures and dozens of vėtrungės. You can also walk across the peninsula from Nida to the dunes and beaches on the Baltic Sea, about a half hour stroll away. On this western Baltic Sea side of the spit, it’s often windy but is yet another great place for a stroll beside the sea. After a storm, people scour the sand near the shoreline for bits of amber. Even though strolling beneath the pines, along the lagoon, or beside the Baltic Sea are the best things visitors can do in Nida, there are also three places to visit for those with more than a day or two here. 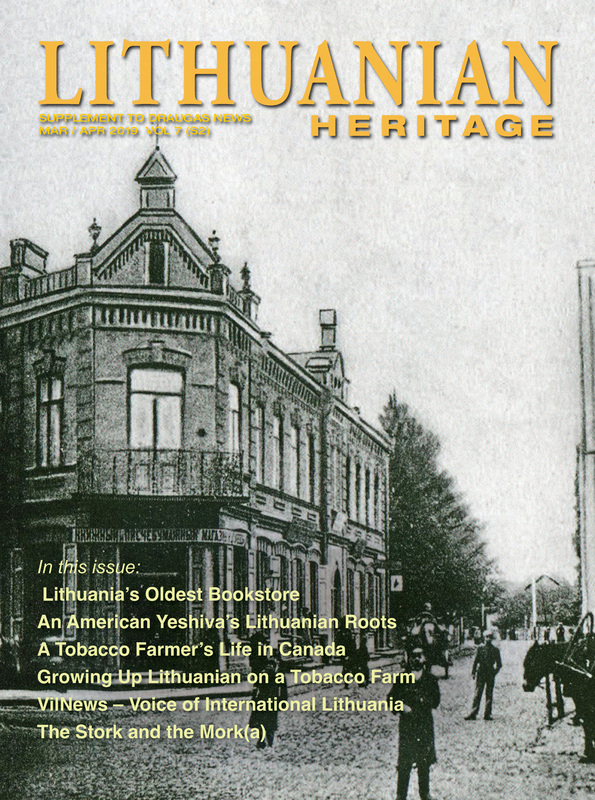 First – and foremost – is the small Ethnographic Museum at 4 Naglių. Housed in a hundred year old fisherman’s house, its rooms are filled with traditional household items, furniture, and fabrics from the late 19th-early 20th centuries. In its front yard are dozens of colorful vėtrungės displayed at eye-level so you can get a really good look at the carvings up close. A 15 minute stroll will take you from Nida’s center (Pamario and Taikos) to the red brick Evangelical Lutheran Church at 43 Pamario. Built in 1888 in neo-Gothic style, it has church services but also hosts music concerts as well. What is most unique about this church, however, is its graveyard full of krikštai, carved wooden crosses that mark graves. Krikštai originated in Lithuania in the 12th century, although these here in Nida are late 19th-early 20th century, erected, logically, after the church was built and the graveyard received its first occupants. Men’s krikštai often have horses, plants, or birds carved on them while women’s have hearts. Situated as it is on a hill under tall pine trees, this cemetery is one of the most atmospheric places in Nida and one I have never missed visiting on my many trips to Neringa over the past 13 years. The ubiquitous vėtrungės are everywhere. Another 15 minute stroll leads north to the Thomas Mann Museum at 17 Skruzdynės where the famous German author built a home that he lived in during the three summers of 1930 to 1932. Mann did not return after 1932 because he went into exile after the Nazis came to power in Germany. 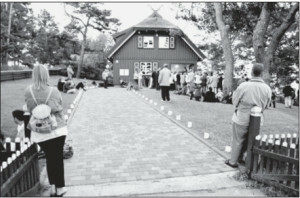 The house has become a “pilgrimage” site, particularly to the many German tourists who come to Neringa. Two other pleasures one shouldn’t miss in Nida are amber shopping and eating. Even if you’re not a shopper, it’s worth a quick stop at the Amber Museum Gallery at 20 Pamario across the street from the Evangelical Lutheran Church. It’s really a shop masquerading under the name “museum,” but I can forgive them because of the beautiful amber jewelry they sell. On this trip, I bought a hunk of amber, with inclusions, made into a pendant framed in silver. It’s one of the loveliest pieces of amber I own. On the trip before this, it was a multi-colored amber bracelet. On the trip before that, it was a greenish amber ring. Need I say more. For less expensive pieces of amber jewelry, there’s always a wide selection – earrings, bracelets, pendants, brooches, and rings – at the vendors who set up shop in the square outside the tourist information center at 4 Taikos. Great for souvenirs to bring home, with inexpensive prices. Another pleasure of Nida is eating, preferably outside on a warm summer evening in a garden or under the pines. Some of our favorites included “Baras Po Vyšniom” at 10 Naglių, “Nidos Seklyčia” at 1 Lotmiškio, and “Sena Sodyba” at 6-2 Naglių? – especially “Sena Sodyba” where we dined three times during our seven nights in Nida. Nice to sit outside among the flowering bushes as if you’re a guest in a Lithuanian home. 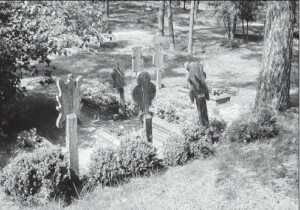 Grave markers called krikštai in the church’s graveyard. One of my best memories of Nida is walking back after dinner one night while it was still light (the sun doesn’t set until after 10 P.M. in Lithuania in early summer) and seeing a stork alight on one of the fisherman’s houses on Naglių gatvė. 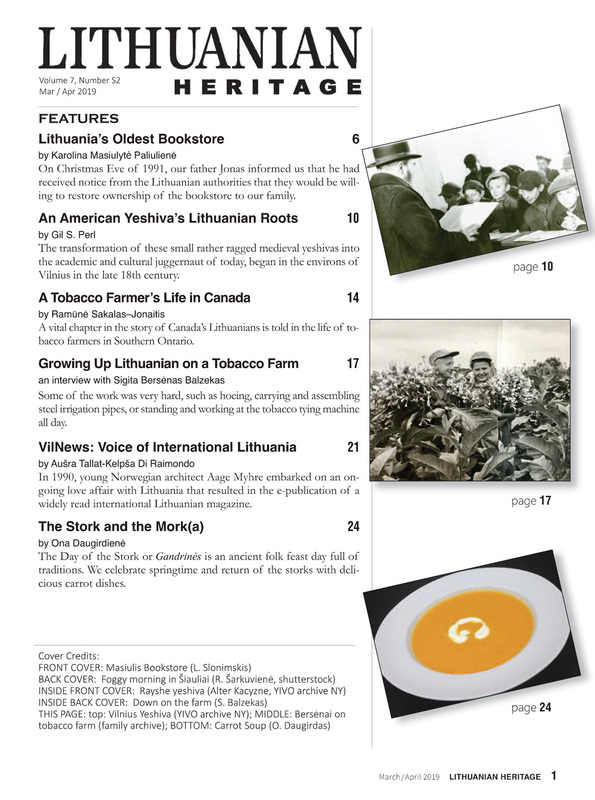 The stork is considered good luck in Lithuania, which probably explains why it’s the country’s national bird. This stork was so close I felt I could touch him, but I did think he was bringing me good luck. Neringa is not just Nida although Nida is clearly my favorite place on the peninsula. There are many other villages lining the lagoon side of the spit “like amber beads on a necklace,” as the waiter at one café told us. My second favorite village is Juodkrantė, about 12 miles north of Nida. There are many reasons to visit this village that straggles beside Neringa’s main road but if I had to choose just one reason it would be Witches’ Hill. It’s delightful. On what was once a dune but has now been reclaimed by forest and shrubbery, there is a pathway that winds its way uphill and down past carved wooden statues from Lithuanian folklore. There are plenty of witches among the almost 100 carvings as well as quite a few ferocious looking demons and devils. My husband claims he wouldn’t walk here after dark on Halloween for all the Kalnapilis beer in Lithuania. It takes about 60 to 90 minutes to stroll the Witches’ Hill path at an easy pace allowing time to enjoy each carving. Another Juodkrantė stroll is right beside the lagoon along a paved winding path past sculptures by Lithuanian and other artists. Most are modern and abstract – with a few totally incomprehensible – but this is still a fun stroll. My favorite of the lot is a bunch of good-sized rocks with metal legs. These are supposedly a herd of grazing sheep. Yes, sheep. They always make me smile. Thomas Mann’s House/Museum is a popular site. Near the lagoon sculptures is a wonderful small Museum of Miniatures at 3 Rėzos exhibiting miniature paintings and sculptures. There are two other places to visit just outside Juodkrantė. One just outside the village on the road to Nida is called “Herons’ Hill.” Visitors can climb the wooden stairs for a birds’ eye view of the herons. Not just grey herons but cormorants too who come here each year to nest. It’s very noisy among the birds but great to see little heads popping up out of their nests. Not so good, however, for the trees which have turned white and lost their leaves from all the bird droppings. Nevertheless, it is an interesting sight. Bring binoculars to see better. One wonders where the birds will nest once the pine trees die. About midway between Juodkrantė and Nida is the Naglių Reserve where a wooden boardwalk leads over “dying” dunes towards the sea. Dying dunes are sand dunes gradually being covered over by plants and shrubs. It’s not an easy walk because of the shifting sand and the distance, but is worthwhile even if you only trudge up to the top of the hill overlooking the reserve. We were told that beneath these dunes lies the village of Nagliai buried by the shifting sands 300 years ago (the inhabitants left before the sand took over their houses). We couldn’t verify this particular village’s disappearance but there are at least a dozen villages that have succumbed to the moving sands over the past few hundred years. Most were re-established nearby. Two other villages to visit, located between Juodkrantė and Nida, are Pervalka and Preila. Both are even smaller than their northerly and southerly neighboring villages of Juodkrantė and Nida. Preila in particular has several nice rustic restaurants beside the lagoon for a quiet lunch or an afternoon snack. It’s fun to eat while watching wind surfers on the lagoon. Most of the Lithuanian portion of the Curonian Spit has been designated national parkland and is therefore protected. In fact, visitors have to pay a fee when entering the protected zone which includes all the villages I’ve mentioned. It’s a one time fee whether you spend a few hours or a few days. But outside this zone at the northern tip of the spit is one final do-not-miss sight for visitors to this unique part of Lithuania. The former Prussian fortress of Kopgalis, built in 1871, now houses a Maritime Museum and Aquarium. A Dolphinarium has shows regularly in which dolphins and sea lions perform.